A Paper-Based Alternative To Foam, The Basic 8-1/2" Plate Is Designed Especially For Lightweight Meals And Snacks And Offers A Crisp, Clean Visual Appeal. Microwavable, Cut-Resistant, Soak-Resistant Plates Are Built Strong And Stack Better. Compact, Low-Stacking Shape Saves Storage Space Vs. Foam. Recyclable Plates Are Not Made With Inks Or Dyes..
A Paper-Based Alternative To Foam, The Basic 8-1/2" Plate Is Designed Especially For Lightweight Meals And Snacks And Offers A Crisp, Clean Visual Appeal. Microwavable, Cut-Resistant, Soak-Resistant Plates Are Built Strong And Stack Better. Compact, Low-Stacking Shape Saves Storage Space Vs. Foam. 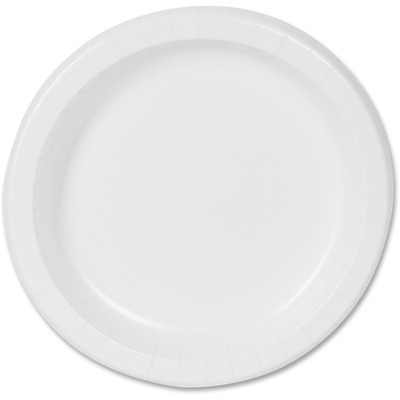 Recyclable Plates Are Not Made With Inks Or Dyes.